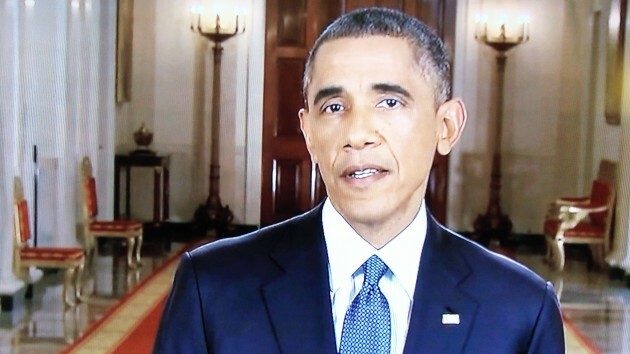 President Obama during his televised address on Thursday. Would it hurt Barack Obama to at least try to look and act like the president of a republic instead of an emperor? Just look at what they now call the “optics” of his announcement on illegal immigrants. On television the country sees a long corridor in the White House festooned in the furnishings and colors of imperial Rome. There’s the scarlet carpet on the floor, the classical lamps in the background, the gilded chairs with red cushions on the side. Into this picture, the man strides to let the country know what he has decided. A president more attuned the constitutional processes of a free country with a separation of powers among three equal branches of government would not take that approach. He would not necessarily have to sit at a desk to address the country. But he would try to avoid acting or looking like he was appearing, Duce-like, on some balcony or rostrum to announce what he, by himself, would do. So much for the appearance. What about the substance? Obama said he would remove the threat of deportation from hard-working people who could prove they had entered the country without authorization more than five years ago. We are not deporting those people now. And obviously, if they are working to make a living, their immigration status does not prevent them from doing so. Five million more “undocumented voters!” All the more to spread “our” wealth around to. It is a lie to state that anything that was said by the president allows those people to vote. You should apologize for your “overstatement” unless you can provide documented PROOF. Well Bob, I’m sure Mr. Engle can speak for himself but I will add my $0.02 anyway. When you combine these ‘undocumented’ people living here with ‘progressives’ making every excuse possible that they should not be forced to prove their citizenship (required) to vote, then you have an enormous opportunity for these ‘undocumented’ people to cast votes in violation of the Constitution. If you think that won’t happen then you are truly ignorant of the realities. There is a reason the left wants open borders. They want complete control of the political process and don’t care what they must do to achieve that goal. They think that immigrants will vote for Democrats and have adopted this as a strategy to achieve that goal. The action taken by King Barack last night was nothing more than an attempt to PICK A FIGHT with the GOP. No REAL change is coming. As Hasso, and MANY others have pointed out, they aren’t being deported now anyway….but it sure makes an appealing argument to the bleeding heart liberals. Truth be damned! The GOP is not so ignorant as to think 11 million people can or ever will/would be deported. Polls have shown, if approved and mandated by CONGRESS, the effective changes announced last night would be favored my the majority of Americans. THAT WOULD BE PROPER AND LEGAL. The problem remains with HOW our King has gone outside the confines of our Constitution in bringing this policy about. We have impeached Presidents for far less. For some reason, the ‘progressives’ in this nation cannot make that distinction, and that the goal justifies ignoring the Constitution and the separation of powers so carefully laid out by our founders. Additionally, as long as the mainstream media ignores their proper role as watchdog to government, King Barack will likely get away with it, AND MORE. You people on the left, and ALL Americans need to keep one thing in mind here. This nation became great because of our adherence to our founding documents, not in spite of them. As I have previously stated on this site, I choose to place my faith in our founder’s wisdom, not the narcissistic whims of a Barack Obama in search of a legacy. Obama could have done all this perfectly legally during his first two years in office when he had a filibuster-proof majority in both houses of Congress. Obama has effectively thumbed his nose (or worse) at the voters that took away his Senate majority in their call for change in Washington DC. And I sleep no better at night knowing King Barack says, in CONTRADICTION to over 25 different videos of ‘el presidente’ saying otherwise, he now deems his action legal and constitutional? Because HE says so? NOW? This is BLATANT hypocrisy, so Bob….you just keep on drinking whatever it is the Emperor serves up. I’d rather die of thirst. Our Constitution was drafted to LIMIT government power. Progressives see this as the government ‘granting’ us our rights. Conservatives understand that our rights are derived from God and that our Constitution guarantees those rights by limiting government to those ENUMERATED rights so carefully spelled out and ratified well over 200 years ago. One more thing. Until that southern border is secured, immigration reform will be a pipe dream. Sounds to me like it’s a bit of “we” lost a lot of seats during the election so I’m going to pout and “get even”. Talk about bullying!!!!!!!!!!!!! !